A new study by the National Association of Certified Valuators and Analysts (NACVA) and Hinge Marketing suggests that a valuation firm’s “visible expertise” is the most important single factor in generating referrals. Visible expertise is developed by conducting activities that promote thought leadership, such as speaking and writing frequently on topics of interest to your target audience. This can raise your industry profile; as more people recognize and trust your expertise, you will receive more referrals. Other factors that can help trigger more referrals, the study found, include professional and social relationships, reciprocity, attending networking events, directly asking for referrals, social responsibility (charitable contributions), and sponsorships. What to do: BVR has opportunities for valuation experts to contribute articles and book chapters, conduct webinars, and provide content for special reports and publications. If you’re interested, please contact the BVWire editor. Make it one of your New Year’s resolutions! It’s not uncommon for a trial court to decide a valuation issue by “splitting the baby”—that is, reaching a compromise somewhere in the middle of the opposing figures. Often the decision, however puzzling, stands because the appeals court is reluctant to find an abuse of discretion. A knotty economics damages case followed this trajectory—until it reached the state Supreme Court. ‘Just splitting hairs’? Two partners owned an equal share of a rock-trading business (buys and sells rock for construction purposes). After one partner died in 2006, the surviving partner (defendant) unilaterally formed a new company to complete the old company’s contracts and pay its debts. He also owned a construction company that was a major buyer of the rock. The decedent’s estate sued, alleging the defendant had breached his fiduciary duty to the old company by usurping a business opportunity, and asked for present and future lost profits. The trial court found the defendant liable. The parties’ damages experts disagreed over the proper way of calculating damages. The estate’s expert essentially performed a lost profits analysis. He explained that the defendant’s construction company bought rock from the subject company but failed to make timely payments. Consequently, the subject company ran into financial problems and risked going out of business. He also found that within the span of eight years, 650,000 tons of rock remained unreported and were diverted from the subject company. After the decedent’s death, that rock went to the defendant’s new company. This diversion of assets resulted in nearly $1.1 million in lost profits to the subject. The total loss attributable to the defendant’s misconduct was over $1.5 million. The defendant’s expert claimed the rock was not unreported. Rather, the defendant “moved the tons” from the old company to the new company because he “kept on running the thing just like he was doing before,” he reasoned. To calculate damages, he performed a valuation of the “net book value” of the subject company and found it was about $125,000. The trial court said the defendant’s expert had accounted for the unreported rock. It called the experts’ arguments over valuation methodology “just splitting hairs.” “Whether you call it asset based or net book value or lost profits, the Court is merely concerned with how and when to value this business.” It then used part of the estate expert’s calculation to determine “historical lost profits” of nearly $105,000. To this amount, it added the defendant expert’s net book value of $125,000 and ordered the defendant to pay $230,000, or $115,000 if the parties agreed to dissolve the company. ‘Illogical’ approach? The Court of Appeals affirmed, but a number of judges dissented. Precedent required the use of a lost-profits analysis to calculate damages for a claim of breach of fiduciary duty or usurpation of corporate opportunity, the dissent said. “Net book value is simply an accounting term that is not directly related to the actual value of the corporation’s assets.” The dissent added it was “illogical” to include a calculation of “net book value” in calculating damages responding to the type of claims at issue. The state Supreme Court called the trial court’s damages assessment arbitrary. Under the applicable principle, the party breaching a fiduciary duty “is responsible for the entire loss suffered by the corporation as a result of the breach.” The loss included the diverted rock. A business valuation analysis was appropriate in divorce and eminent domain cases as well as in dissenting shareholder disputes, but not in the instant case. The high court remanded for a new damages determination. Takeaway: The high court rejected the trial court’s loose attitude toward valuation concepts such as “asset approach,” “net book value,” and “lost profits” and found the lower court used the wrong accounting methods to calculate damages. Find an extended discussion of Lane v. Lampkin, 2015 Miss. LEXIS 503 (Oct. 8, 2015)(Lampkin II), in the January edition of Business Valuation Update; the court’s opinion is available soon at BVLaw. The appeals court decision, Lane v. Lampkin, 2014 Miss. App. LEXIS 497 (Miss Ct. App., Sept. 16, 2014), is also available at BVLaw. The Pepperdine Capital Markets project conducts ongoing research concerning the cost of private capital across market types and the investment expectations of privatelyheld business owners. The International Business Brokers Association (IBBA) and M&A Source Market Pulse Quarterly Survey Report for the third quarter of 2015 (3Q15) examines the market conditions for businesses being sold in Main Street (values $0 to $2 million) and the Lower Middle Market (values $2 million to $50 million) sectors. Looking at the data the last five quarters, valuations are similar for all sectors. The report found “a slight decrease” in the $1 million to $2 million valuation range. The median multiple paid (SDE) was 2.8 for 3Q15 (down from 3.3 in 3Q14) and the median multiple paid (EBITDA) was 3.5 for 3Q15 (down from 3.8 in 3Q14). “This tends to be the price range at which individual buyers are priced out and existing businesses owners are inclined to buy, but only when it can add to their current operations,” says the report. The survey for 3Q15 was completed by 192 respondents, representing 20 regional and international M&A and business broker associations. A research paper examines the extent to which economic incentives may have improved for appraisal arbitrageurs in recent years, which could help explain the observed increase in appraisal activity. The authors document that the Delaware Chancery Court “seems to prefer a lower equity risk premium than bankers. Such a systematic difference in valuation input choices also works in favor of appraisal arbitrageurs.” The paper concludes that appraisal arbitrageurs enjoy an economic benefit by delaying their investment until after the record date, as they are privy to better information about the target’s value while minimizing their exposure to the risk of deal failure. The authors propose several recommendations, including limiting the ability of shareholders to seek appraisal for shares acquired after the record date. The paper is Appraisal Arbitrage—Is There a Delaware Advantage? by Gaurav Jetley and Xinyu Ji (both with Analysis Group, Inc.). Dr. Cindy Ma, Global Head of Houlihan Lokey’s Portfolio Valuation & Advisory Services practice, was interviewed about the need for third-party valuation providers and the best practices in portfolio valuation being adopted by private fund managers due to increased regulatory scrutiny. One question the interviewer asked: When the valuations are finally completed, they are generally handed off to the auditor. How do you think their review process has changed over time? The full interview, which appears in private funds management (pfm), is available if you click here. The SEC is turning its attention back to accounting and auditing cases after the financial crisis forced it to focus on insider trading cases, Ponzi schemes, and the like, reports AccountingToday. The SEC recently announced two high-profile cases against BDO and Grant Thornton. In the Grant Thornton case, one of the issues was over the timing of a client’s $58 million impairment charge. The audit firm failed to obtain adequate audit evidence to support management’s conclusion that the impairment had occurred after a significant public offering by the client. The Private Company Council (PCC) has voted to remove the effective dates from the four accounting standards updates that it has created to provide GAAP alternatives for private companies. This action would permit private companies to forgo a preferability assessment the first time they elect the accounting alternatives contained in those updates. The four standards containing GAAP alternatives for private companies include: Accounting Standards Update (ASU) No. 2014-02, Intangibles—Goodwill and Other (Topic 350); ASU No. 2014-03, Derivatives and Hedging (Topic 815); ASU No. 2014-07, Consolidation (Topic 810); and ASU No. 2014-18, Business Combinations (Topic 805). The PCC also added a project on variable interest entities to its agenda. For a good 2015 wrap-up of PCC developments prepared by PwC, click here. BVR extends sincere thanks to these and all of the individuals who have helped BVR build Pratt’s Stats into the essential data source it is today. With all of the irresistible holiday goodies surrounding us, we’ll all be in need of a good workout soon, most likely using some of the strongly branded sports products and gear available. 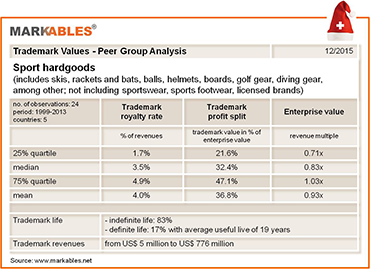 December’s brand value snapshot from Markables covers this very sector and compares the brand valuations of 24 sport hardgoods brands between 1999 and 2013 in five countries. Some prominent brands in the peer group are Adams, Cobra and Top Flite (golf gear), Salomon and Rossignol (skis), or Spalding and Rawlings (ball sports), among others. Down to earth multiples: Trademark royalty rates for the sector range between 2% and 5%, with mean royalties from 3.5% to 4.0% (see table below). Trademark profit split is at around 35%. Thus, brand value multiples for the sector are more down to earth than what could have been expected from typical royalty rates charged by the large sports property licensors (8% to 10%). The reasons could be stagnating revenues and weak profitability for sporting goods; average enterprise value multiples for the sector are 0.83x revenues only. For sportswear, average brand value multiples are roughly 50% higher than for hardgoods. The analysis illustrates that sports league and event-based royalty rates cannot simply be transferred into long-term ownership valuations, without reasonable adjustments. An 8% rate on revenues applied into perpetuity may easily result in brand value exceeding enterprise value. Markables, based in Switzerland, has a database of over 6,500 trademark valuations published in financial reporting documents of listed companies from all over the world. The database reports value solely for the use of trademarks (not bundled with other rights). Coverage continues of the BV conference season. We have added a new regular feature for 2016: BV News At-a-Glance, which is a monthly roundup of key developments from the standard setters, regulators, and valuation professional organizations (VPOs), as well as noteworthy new books, research papers, and studies of interest to business valuation experts. NY’s Unfair Application of Shareholder-Level Marketability Discounts (Gilbert E. Matthews and Michelle Patterson). In contrast to the other states, New York applies marketability discounts at the shareholder level in fair value determinations, which harms dissenters by transferring value to continuing shareholders. Judge Laro Toplines Panel on Hot Issues in Tax Valuation (BVR Editor). A panel session by several of the leading minds on taxation to discuss hot topics in valuation was a highlight of the 2015 AICPA FVS conference in Las Vegas. Some Key Takeaways From the AICPA FVS Conference (BVR Editor). Valuation experts hit the jackpot in Las Vegas at the AICPA’s annual event. There were some great sessions that offered practical advice for a wide variety of valuation issues, from cost of capital to economic damages to the valuation of marijuana firms. AICPA Conference Covers Healthcare Valuation Challenges and Opportunities (BVR Editor). The big valuation challenges in the industry continue to center on health reform and changes to reimbursement models. Also, the determination of the FMV of physician compensation is a hot-potato issue in the center of recent major court cases. Defending the Use of a Monte Carlo Analysis in Court (BVR Editor). A third of valuation experts tell BVR that they don’t use Monte Carlo analysis because they are “concerned about defending this method if challenged by third parties.” Michael Pellegrino (Pellegrino & Associates LLC) shares his experience and advice for those who may come up against a challenge. BVU Profile: Newest BVU Editorial Board Member Is a Strong Advocate of Education (BVR Editor). An interview with Harold G. Martin, Jr., who is partner in-charge of valuation and forensic services for Keiter, a CPA and consulting firm in Richmond Virginia. Business Valuation Year in Review 2015 (BVR Editor). Services LLP) who started his BV career at American Appraisal in 1969. He went through an incredible ordeal with the IRS that can happen to anyone today. 10 Best Valuation Cases for 2015 (BVR Editor). Our pick for the top 10 valuation-related court cases from last year. Regular Features: BV News At-a-Glance—key developments from the standard setters, regulators, and VPOs, plus noteworthy new books, research papers, and studies of interest. Ask the Experts and Tip of the Month—valuation experts answer puzzling questions and give some practical advice on a wide variety of topics. To read these articles—as well as digests of the latest court cases—see the January issue of Business Valuation Update (subscription required). People: Jeffrey Gibralter, a partner at Klein Liebman & Gresen of Syosset, N.Y., has been appointed vice chair of the BV committee of the New York State Society CPAs and treasurer of the Estate Planning Council of Suffolk County . . . Keith Meyers, shareholder at Perkins & Co., Portland, Ore., was named to AICPA’s business valuation committee. Firms: The Dutch firm AppraisAll joined the MG Valuation Alliance, an alliance that assists accounting and consulting firms by providing real estate, machinery, and business valuation worldwide . . . The St. Louis-area firms Bergman, Schraier & Co. and Brown Smith Wallace will merge on January 1. Canahuate Calderon & Asociados, a firm based in Santo Domingo, Dominican Republic, that provides services primarily in the retail and consumer, agricultural, pharmaceutical, and insurance sectors, has joined UHY and will rebrand as UHY Canahuate Calderon & Asociados . . . Dean Dorton Allen Ford, an accounting and consulting firm based in Lexington, Ky., merged with Barr Anderson & Roberts, a CPA and advisory firm also in Kentucky . . . KatzAbosch was honored as one of the 2015 Top Workplaces by The Baltimore Sun . . . Gorfine, Schiller & Gardyn, a full-service public accounting and business valuation firm in Owings Mills, Md., was also honored by The Baltimore Sun as one of the 2015 Top Workplaces . . . Tempe, Ariz.,-based Henry & Horne acquired Anderson, Church & Co., a Tempe accounting firm that has served individuals and businesses across Arizona for 40 years . . . Rager, Lehman & Houck, a regional accounting firm with offices in Pennsylvania and Maryland, has merged with Dallavalle & Co. of Frederick, Md., and rebranded as RLH CPAs & Business Advisors . . . Portland, Ore., firm Perkins & Co. was named by the Portland Business Journal as one of Oregon’s 2015 Most Admired Companies. CPE events: Out with 2015, in with 2016! Some excellent events are on the schedule for the rest of 2015 and to usher in the New Year. Valuing Electrical Contractors (January 5), with Erin Hollis (Marshall & Stevens) and Matthew Crane (Marshall & Stevens). Residual Contribution Method (January 7), with René Hlousek (Beacon Valuation Group LLC). This is Part 9 of BVR's 2015 Special Series on Intellectual Property. After taking a break for the holidays, BVWire will be back on Wednesday, January 6. Have a safe, joyful, and prosperous holiday season!